Authentic Mexican Street Corn on the cob covered in garlicky mayo and topped with Cotija cheese, cilantro, and chili powder. It’s the perfect Mexican summer side dish for your next bbq or outdoor grilling! I have been seeing the first bushels of corn show up in the grocery stores around here lately, and that is probably the real herald of summer for me, even more than school being out and the days getting hotter. 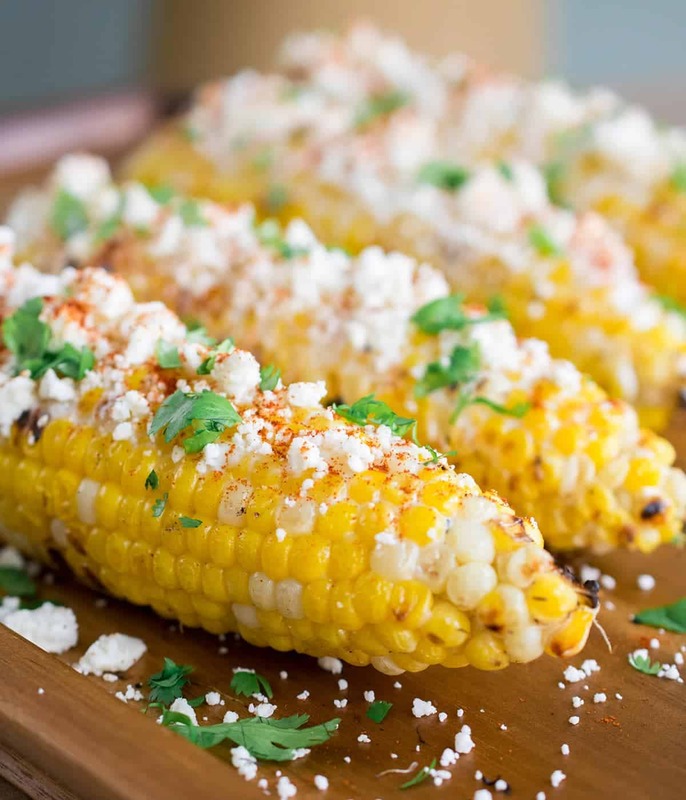 You have probably had grilled corn on the cob before, but today we are taking it up a notch by making Mexican Street Corn. 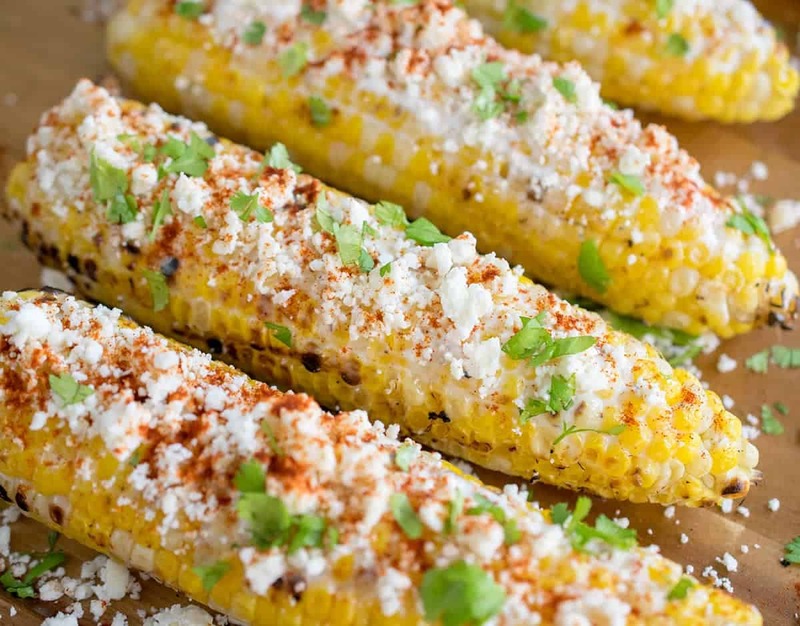 A common Mexican Street Food, also known as Elote, the grilled corn is slathered with a mixture of cotija cheese, mayo, sour cream, chile powder, and lime and then topped with more cheese. This is THE summer bbq side dish and it’s addictive. There is no food that perfectly embodies summer than grilled corn, and this is definitely a special recipe! Serve it with a refreshing limeade (or maybe a Mexican Paloma Cocktail) and then go full siesta mode. The lazy days of summer are here! Cotija cheese is a tangy, salty grating cheese that is the traditional topping for Mexican Street Corn. It is similar to Parmesean. In Mexico, cotija is typically aged about 100 days and called anejo. However, it may or may not be available at your local grocery store. Since we are using the fresh version, use Feta as a Cotija substitute. Sometimes I also use Parmesan and it is also delicious. This garlicky-lime cream sauce is simply perfection and you might find yourself craving it at wierd times after trying it. Or, maybe that’s just me. But if you are lacking a grill (or maybe its just too hot outside to fire it up)and you are craving this, no worries. 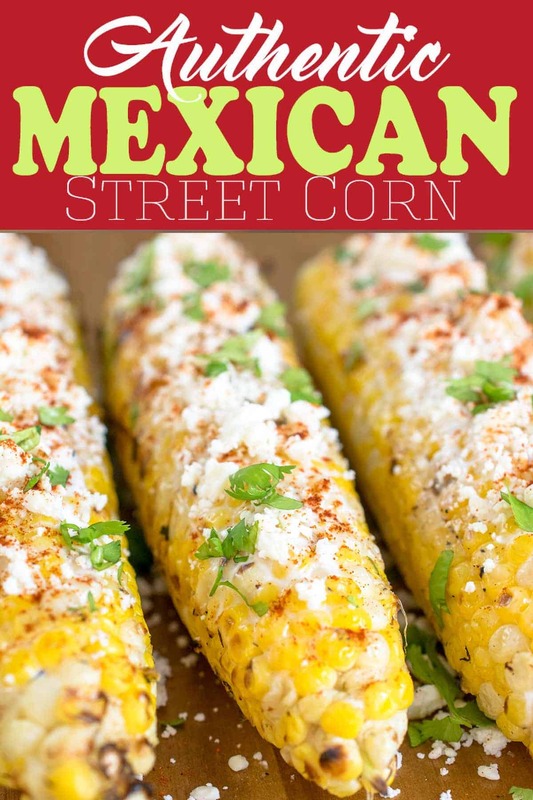 Making Mexican Street Corn with no grill is still possible! Here are a few options for using your oven. Pop the corn on a cast iron pan and put it in the oven on broil. Turn the corn a few times to evenly cook. Same as the cast iron method but leave the husks on and broil it in the oven as well. Or forget the cob and make a simple Mexican corn salad using just the kernels. Authentic Mexican Street Corn on the cob covered in garlicky mayo and topped with Cotija cheese, cilantro, and chili powder. It's the perfect Mexican summer side dish for your next bbq or outdoor grilling side dish! Light a grill. Season the corn with salt and pepper, if desired. In a small bowl, stir together the mayo, sour cream, and garlic powder. Place the corn on the hottest part of the grill and cook, turning as needed, until cooked through with nice grill char marks, 8 to 10 minutes. Remove the corn from the grill and immediately brush each cob liberally with the mayo mixture. Either roll the ears of corn in cotija cheese or sprinkle the cheese liberally over top. Transfer to a platter. Garnish each cob with a sprinkle of chili powder and cilantro. Serve with lime wedges, if desired. These corns look so delicious. Thanks for sharing the recipe. It looks so yummy. I just can’t wait to make it. Thanks for the recipe. This looks incredible! I’ll never eat corn the same way again!